The markets traded between flat and slightly lower in early trade Monday morning after Friday’s strong gains. The EUR/USD continues to be choppy around the $1.22 level and is contributing to some of the volatility we are seeing in the equities markets. Combine that with the lackluster summer participation by major market players who are on vacation and we are left with an ambiguous, indecisive, and directionless market. I sound like a broken record since there is nothing new to report or insight to be added. 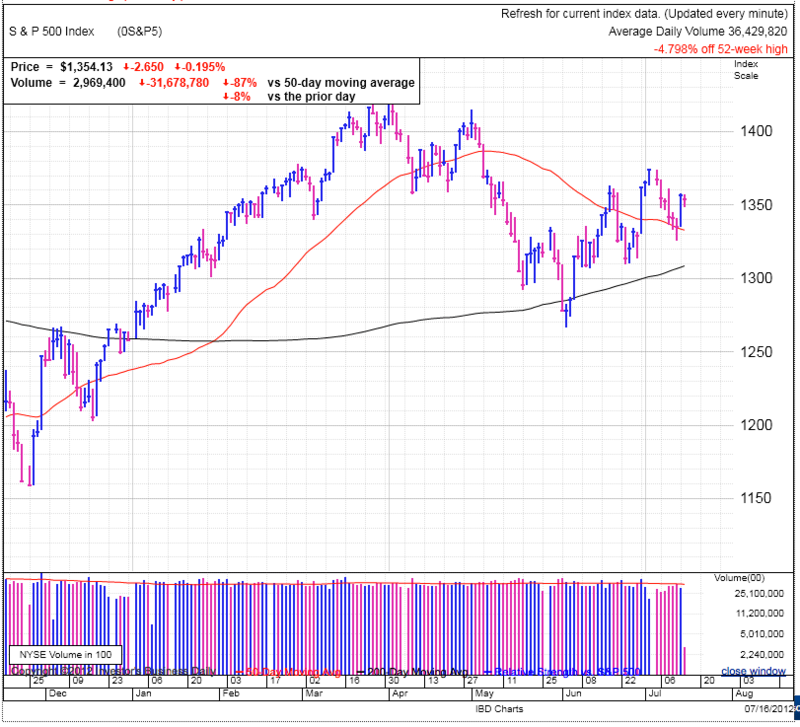 It has simply become a waiting game as we consolidate in this range before the market is ready to make its next move. Earnings have been lackluster with many companies lowering their full year guidance. The stocks that are doing the best as a group are the defensive sectors, including discount retailers, consumer product companies, and medical. Hardly the best environment to be speculating in hyper-growth CAN SLIM companies. But this is a good thing for the patient investor since stocks come in and out of favor. The typical IBD stocks are taking breaks and building bases, creating a strong foundation to make their next move higher once investors’ apatite for risk returns. The most successful traders are the ones who know when to trade and when to sit on their hands. I’ve always found it is easy to make money in the markets, the biggest challenge is keeping it. That includes both knowing when to lock in worthwhile profits, as well as when stay out of the markets and wait for a better opportunity. We continue to hang out in the upper end of the recent range, where we go from here largely depends on what a person’s outlook is. A directional trader would be excited by the series of higher-highs and higher-lows. Someone who thinks we are still basing in a trading range would expect a move lower in the future because we are currently in the upper end of the recent range. I’m in the latter camp, but will change my tune pretty quick if we keep making new highs.